Eat doughnuts and stay healthy!? These healthy doughnuts will give you almost the same satisfaction, if not more so, than the classics we’ve all come to know and love, except with heaps more nutritional value. You can relax about eating ”junk” food, knowing that these bad boys are actually good for you and they treat your sweet tooth all in one. Now that’s the kind of ”cheat food” we’re interested in! It’s important to note that just because something has a high nutritional content, doesn’t mean it’s healthy to over-indulge in them. As with a lot of foods, they are best had in moderation. At The School of Natural Health Sciences we believe that nourishment is one of the necessary pillars that support a balanced lifestyle. Unless we absolutely have to restrict ourselves for medical reasons, there is no sense in denying ourselves one of life’s great joys. The traditional doughnut recipes are high in bad cholesterol and damaging sugar content, so that’s no fun and should be eaten only in emergencies. (A doughnut emergency, why not?) 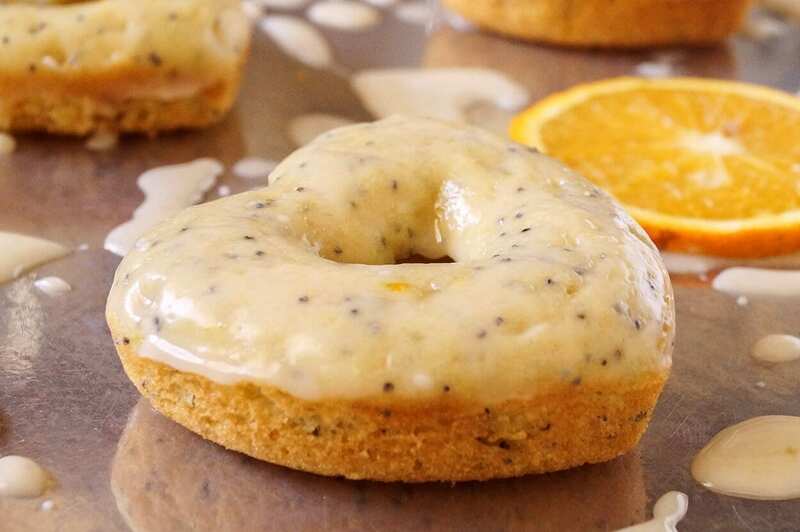 However, where there’s a will, there’s a way, and both have been applied in order to create these marvelously delicious and nutritious alternative doughnut recipes. We hope you enjoy them as much as we have. Courtesy of Pure 2 Raw, this first creation is our favourite. Gluten-free, soy-free, vegan and fun to make with the kids. Add in coconut sugar, pumpkin puree, coconut oil into a bowl. Stir then add in your dry ingredients. Add in buttermilk and stir till combined. Bake at 350ºF for 16-20 minutes. Once doughnuts are done remove from pan and let cool on cooling rack as you get your toppings ready. 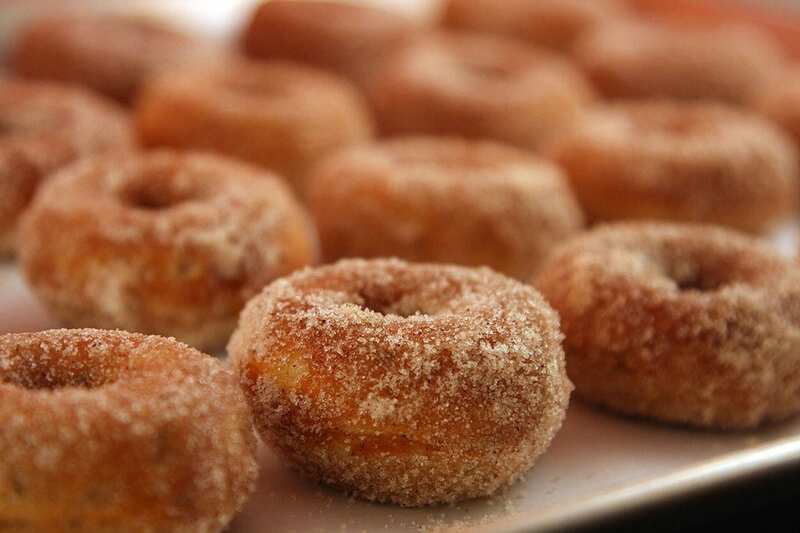 Grab a pumpkin doughnuts and dip into your cinnamon glaze then into your bowl of pecan flour. Continue to dip your doughnuts into the glaze and pecans till all donuts are coated. This next recipe has been scrumptiously concocted by Jess over On Sugar Mountain where she has her own delectable food blog. These soft brown puppies are fluffy, flavourful and extremely more-ish. Preheat doughnut maker (or your oven to 350ºF) and if using a doughnut pan, grease with cooking spray. Combine sugar with spices (cinnamon through nutmeg) until well mixed. 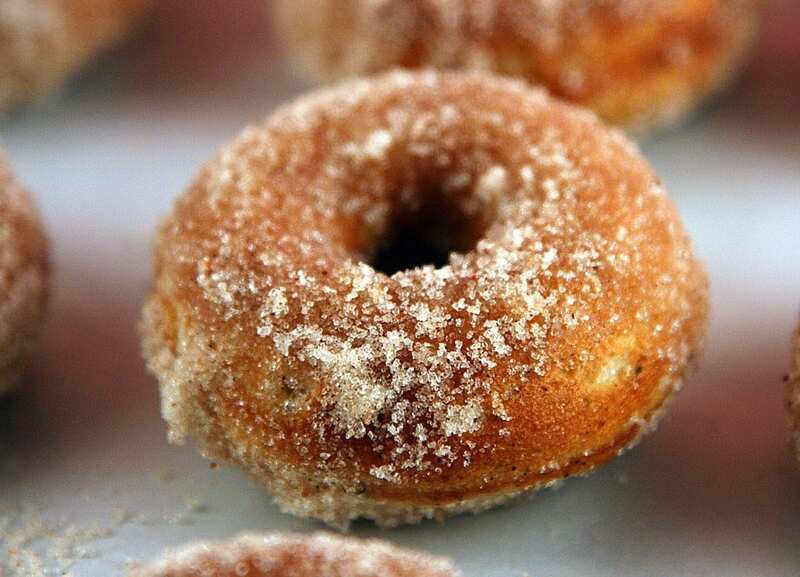 Remove 3/4 cup sugar for the actual doughnut batter, set aside the remaining 1 1/2 cups for later. Meanwhile, in a measuring cup combine milk and vinegar and let stand 5 minutes. In a large bowl combine the 3/4 cup sugar/spice mixture with flour, baking powder, and salt. Open chai tea bag and stir contents into the flour mixture. In a separate, smaller bowl, whisk together milk/vinegar mixture with melted butter, egg, and vanilla. 4. Pour wet ingredient mixture over dry ingredient mixture and stir with wooden spoon until just combined and the batter looks smooth. Spray doughnut maker with cooking spray and fill cavities 1/2 full with doughnut batter; if using the oven fill doughnut pan cavities halfway full with batter. Bake for 4 minutes, or until doughnuts spring back when lightly touched or a toothpick comes out clean. Place remaining sugar/spice mixture from step one in a plastic or paper bag and have your 6 tbsp melted butter in a small bowl. Working two or so at a time, dip doughnuts in melted butter, then place in bag with sugar mixture. Gently toss/shake the bag to cover the doughnuts. Remove and set on piece of parchment paper while you dip the rest of the doughnuts. Our third recipe provided by Maryanne Cabrera from The Little Epicurean calls for some zest! Orange to be exact. I’m more of a lemon zest type of gal, but these proved to be delightfully fresh and tasty. She mentions that the recipe would work just as splendidly if you substitute lemon in place of orange, so it’s down to a matter of preference. Preheat oven to 350ºF. Prepare a piping bag fitted with a small round tip. Lightly grease mini donut pans with cooking spray. Set aside. In a small bowl, whisk together flour, baking soda, baking powder, and salt. In a medium bowl, cream together butter and sugar until smooth. Add in lightly whisked egg. Mix until egg is incorporated. Add orange zest and poppy seeds. Add 1/3 of flour mixture. Fold to combine. Add half of milk. Mix. Repeat and end with flour. Mix until combined. Transfer batter to piping bag. Pipe batter into prepared doughnuts pans, filling to a little over half full. Bake for 6-8 minutes. Let cool in pan for 2 minutes before removing. Let doughnuts cool on wire rack before dipping in orange glaze. Whisk together powdered sugar and orange juice until smooth. Dunk in cooled doughnuts and let set on wire rack. Our final and delicately chosen doughnut recipe for our healthy indulgence list has got to be one with a berry icing topping. I’ve always gone for the fruity delights and I find a berry filling or topping completes any pastry wonderfully. This truly divine recipe written by Becky who has a food-dedicated website called The Vintage Mixer, has managed to combine a variety of distinctive flavours that come together surprisingly perfectly. Preheat oven to 425°F. Lightly grease a doughnut pan. Combine flours and next 4 ingredients (through salt) in a large bowl, stirring well with a whisk. Combine kefir, eggs, honey, butter, and vanilla, stirring well with a whisk. Add wet mixture to flour mixture; whisk just until combined. Spoon batter into doughnut pans, filling two thirds full. (Use a piping bag if you want to be more exact). Bake in middle of oven until doughnuts spring back when touched and are golden. Let cool in pan slightly (about 4 minutes); turn out onto a wire rack. Top with a mixture of sugar & nutmeg or dip into berry icing. Over the stove, cook berries with sugar and a couple tablespoons of water over medium heat until the berries are cooked down to a sauce (about 15 minutes). Strain into a bowl to get rid of any seeds then add 1 1/2 cups of powdered sugar and 1/2 tsp vanilla extract. Mix well.